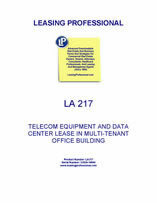 This net lease is designed for a telecommunications tenant operating a colocation and switching facility in an office building. The tenant will be providing telecommunications services to other tenants in the building, as well as third parties located elsewhere. The rentals (including payments for operating costs) are to be made by wire transfer. 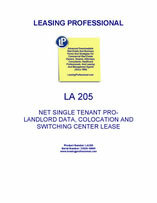 This pro-landlord net lease is designed for a single tenant facility to be built for a telecommunications tenant operating a colocation and switching facility. The premises will be constructed by the landlord, and the tenant will receive a construction allowance to pay for a portion of the improvements. The tenant has the benefit of renewal options and a right of first offer to purchase the premises if the landlord decides it wants to sell the building. Exhibits included: Rules and Regulations, Guaranty, Memorandum of Lease, Letter of Credit Form. 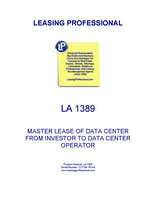 This lease is designed to operate as a master lease of a data center to a data center operator who will, in turn, enter into customer agreements for data and telecommunications services. Such customer agreements are considered to be permitted subleases or license agreements under the assignment and sublease provisions of the master lease. The master lease also contains a guaranty form whereby the corporate parent of the tenant operator will guarantee the performance of the tenant under the master lease.